After a very stressful week, a few colleagues of mine wanted to de-stress. When I say de-stress, I mean enjoy a much deserved buffet meal as we have been through the seventh level of hell and back. However, that's just me saying and that could be just my tummy saying. I was informed earlier that in order to get a spot in Sambokojin, you have to reserve at least a day before. The nearest branch was in SM Southmall and when we arrived, the establishment opens its door at 5:30PM. We then made a short rounds to kill the time. When we got back, a flock of people were waiting and some even were just random walk ins waiting against hope to get a spot. After a few minutes the receptionist started calling out the guests with reservations. So this happened when we reached the table I reserved for us. I just knew they would spell my name incorrectly, how much more if I added my second name? In any case, it felt rather great seeing your name there amidst the misspelling. I was utterly elated that I was merely seconds away from enjoying this much deserved #treatyoself day. 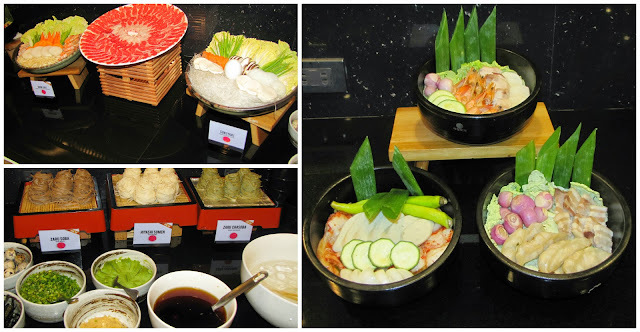 Pardon the next photos as these may cause drooling and you directly dialing Sambokojin for your reservation. I love the Octopus Sushi, Kimchi Roll and the California Maki. I had to stop myself as they would fill me up really fast due to the rice. We headed our way to the raw meat where Hershey found these lovely pork belly skewers. These are just to die for! You had to ask it from the staff as it is not displayed on the open fridge out in the front. Forgot to mention they had prawns and some squid slices too. Yes, that was my go to option. 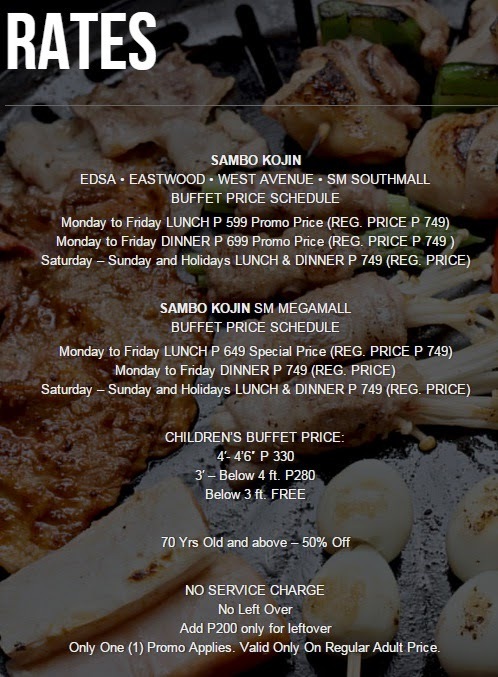 This Php699 dinner better be good and I would totally maximize the time and the food items that are pretty expensive like premium beef and prawns. Out in the back they have Korean and Japanese main dishes. If you are a fan of takoyaki they have it as well. Freshly made by their staff in the front. I just love how the bonito flakes dance happily on top of hot food like takoyaki or kameyaki. 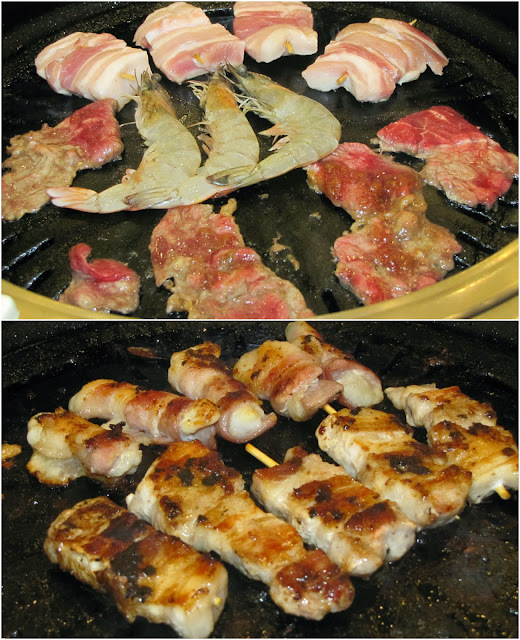 And of course they have the usual yakitori for selected food options only. There is also an option for Sukiyaki or the usual Shabu-Shabu and Cold Noodles. I love that the options were too overwhelming that you barely can eat everything at once. This makes Sambokojin a good value for your money. Clean stations, well maintained interiors, ever visible staff although they do need to be coordinated when it comes to the drinks. A colleague had to ask at least four times to get her second filling of the bottomless soda. They have tons of dessert options and a few salad options. For the rice eaters, they have a huge rice cooker and also an array of hot soup. You can truly enjoy everything and as for me, I focus on what I like: seafood, exquisite meat and then some fruits. If you want to know how many people were there when we dined? It was packed! Totally packed to the brim. Truly a good place for indulgence. Go ahead and reserve your seats today!